Bloomingdale's Gift Card may be used to purchase merchandise and in-store services at all Bloomingdale's 40 store locations as well as Bloomingdales.com. For store locations, please visit Bloomingdales.com or call 1-800-777-0000. National Gift Card is the best place for you to order Bloomingdale's gift cards in bulk. We are the experts in all things gift cards and can set up your gift card solutions program for you today. Please contact us for more information on bulk, direct-to-recipient, or individual gift card fulfillment for your gift card program. Contact us here or call us at 888-472-8747 today! For balance or customer service go to bloomingdales.com/gcbal or any Bloomingdale's store, or call 1-800-511-2752. This card is redeemable only for merchandise and in-store services at Bloomingdale's (USA stores only) and bloomingdales.com; it may not be redeemed for cash (except as required by law) or applied as payment or credit to any credit card account. 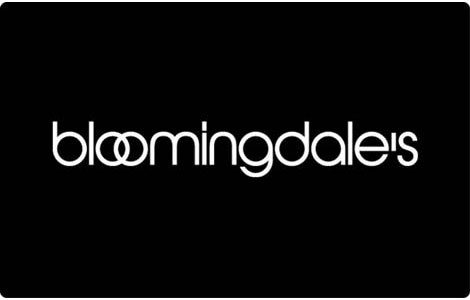 Bloomingdale's cards may be purchased as a gift or given in place of issuing a credit to a credit card or a proof of purchase return from another payment method. Returns may be applied to this card. Card receipts will show any remaining balance. Protect this card: you are responsible if it is lost or stolen. Lost or stolen cards will only be replaced with proof of purchase and only for the value shown on our records. Bloomingdale's gift cards are non expiring. This card is issued by Bloomingdale's Gift Card, LLC and is required for all inquiries.